With three comfortable positions, retractable lock bar, self-adjusting suspension and a convenient tray, this 3-position heavy duty bariatric Geri chair recliner by Drive Medical includes a bevy of features. This bariatric model is extra strong, able to withstand a weight capacity of 500 pounds. 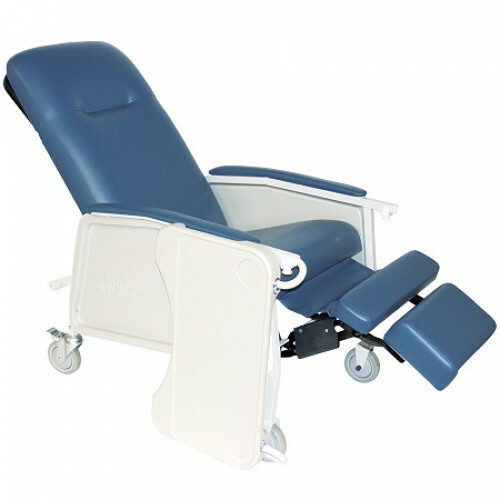 The chair can be positioned upright, in a deep recline or with the leg rest/footrest elevated, and a retractable lock bar secures the chair in your desired position. The self-adjusting suspension prevents the problem of the user "bottoming out" in the seat, which is protected from seepage by a moisture barrier. 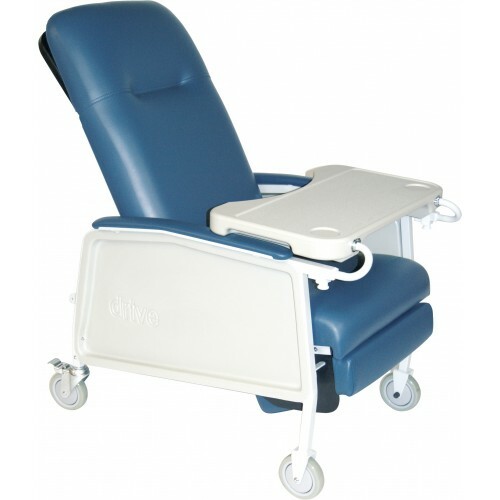 The product includes a large, blow-molded tray that locks in 5 positions and can be stowed away on the side of the chair. The comfortable "built-in" headrest and wide, comfortable, padded arm rests were constructed at an angle to provide support, even in a reclined position. The 5" casters (2 complete with locks) allow for simple movement and security of the recliner. The neutral colored, sturdy steel frame is easy to clean and maintain, with side panels that pop off for cleaning and maintenance. All foam and vinyl meet California Flammability standards, and the product also meets both standard and Boston Fire Department specifications. Comes available in the following colors: blue ridge, jade and rosewood.